Is there such a thing as the “New Ballpark Bump”? 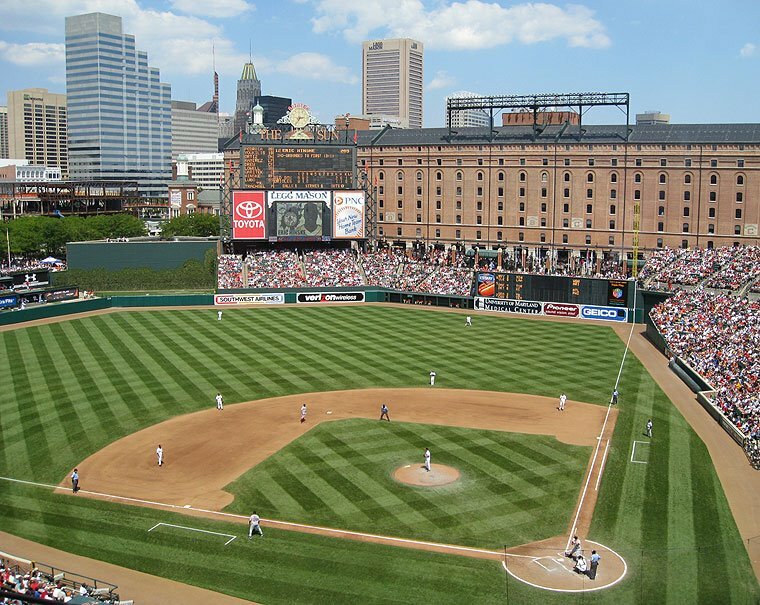 Sixteen teams have opened new ballparks since the Orioles indirectly facilitated a stadium renaissance with Camden Yards’ debut in 1992. Much is written about baseball’s attendance figures. However, the relative success of teams with new ballparks at attracting fans is less explored. And this has occurred despite an abundance of examples from which to choose. We’ve read about the O’s declining attendance numbers, the effect of D.C. baseball on the Baltimore market, the annual Camden Yards takeovers when either of the Evil Empires is in town, and – to some degree – Major League Baseball’s fleecing of Big League cities for public money (see, for example, S.L. Price’s Sports Illustrated column on Nationals Park, where he notes, “At a time when the civic burden for stadium construction was usually between 60% and 70%, D.C. agreed to pick up a whopping 97% of the tab.”) But what can be learned by taking a step back and looking at the ballpark construction craze through a wider lens? The topic invites many intriguing questions. What does a new stadium do for a team’s attendance numbers? There’s the Colbert Bump, but is there such a thing as a “New Ballpark Bump”? If so, how long does it last? Are sellouts the norm when the gates first open in baseball’s newest cathedrals? How long does it take before the novelty wears off? Does a team’s recent history of wins and losses and/or its current performance factor into the equation? These and other related questions are relevant to baseball fans nationwide. However, they should be of particular interest to game watchers in the Mid-Atlantic region where baseball’s two Major League franchises, the Orioles and the Nationals, serve as the current bookends of the building boon. We have the O’s attendance figures from 1992; the Nationals figures are marked “in progress.” Nevertheless, it’s not too early to look at the numbers for these two teams and the fifteen other franchises that have built stadiums in between them to see what patterns emerge. To start the conversation, Roar from 34 examined the attendance figures from all 17 teams that have introduced new ballparks since 1992. The focus of this initial exercise was simply to see how well each team attracted fans through its first seven home games (the Nats have played seven contests at home heading into Wednesday’s game, thereby providing the benchmark for this comparison.) While factors like stadium size, wins and losses, and the respective climates of the cities examined can affect how many fans visit the park, the early season numbers offer a starting point for a continued discussion of the New Ballpark Bump. Below is a rundown of the early season numbers for each team that has opened a new stadium since 1992. Teams are listed in descending order by average attendance. The year the team’s new stadium opened is listed in parentheses, followed by the team’s average attendance through the first seven home games of that season (not the current season, except for the Nationals). Commentary is offered for each of the four groupings. Comment: Our beloved Birds fair very well in this comparison. Here’s hoping the team can bring the locals back to Camden Yards with some winning seasons. The Diamondbacks, a new franchise when their park opened in 1998, drew the highest seven-game average to the largest of the new ballparks (49,033). Perhaps the charm has worn off a bit in the interim considering the team couldn’t sell all of its playoff tickets last season. The Mariners are the only team among those examined to open a new stadium in the middle of the season, which presumably made it easier to draw fans (better weather, school’s out, etc.). The Giants deserve the most credit for two reasons: 1. They were the only team to sell out each of its first seven games. (If you’ve been to that beautiful ballpark, where sitting in the upper deck is a treat given the view of the Bay, you know why.) 2. The stadium formerly known as Pac Bell is the first privately funded effort since Dodger Stadium opened in 1962. Comment: Commonly known as the best baseball town in America, St. Louis perches at the top of the second tier. Busch Stadium is the second-youngest ballpark among the crop of newbies. The rival Astros, with a quirky, considerably less traditional park, fall slightly behind the Cards in more than just the NL Central standings. Comment: You could make a case for weather being a factor in the comparatively small early season gates for Colorado and Cleveland. That doesn’t explain the Braves, who seem to suffer a bit from their own regular season success and post-season flame outs when it comes to drawing crowds. If you can’t sell out during the playoffs, chances are you’re not going to do so during the regular season. Comment: Ask a college student about Natty Light and he or she thinks about beer. Ask a baseball fan about Natty Light and he or she may well think about the Nationals’ attendance figures. The official numbers show that the Nats didn’t fill each of the new stadium’s 41,000+ seats on Opening Day, and it hasn’t gotten any better since then. However, success can quickly change a team’s attendance fortunes. Just ask the Tigers, who bottomed out on this list but have since recovered. While PNC Park is sometimes dubbed baseball’s best ballpark (beg to differ – see numbers two and three on the linked list), Pittsburgh fans haven’t exactly flocked to the stadium. As the numbers show, it’s been that way almost from the get-go. It might have something to do with the losing (see, for example: Camden Yards, 2008).